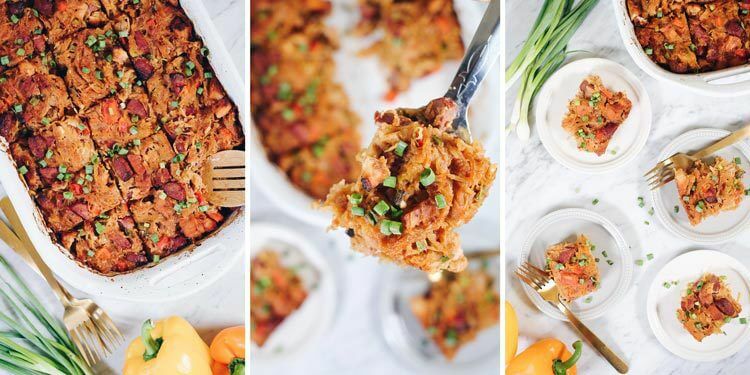 So, we learned from one of our meal plan subscribers that she could get spaghetti squash pretty much year round, and we were instantly jealous! 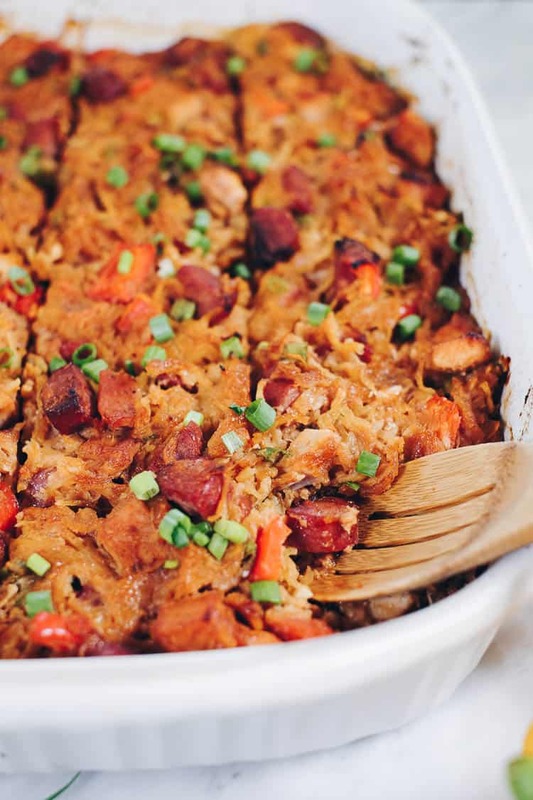 We love making all kinds of tasty spaghetti squash casseroles, like this BBQ chicken casserole, but we have a shorter period of time in the Pacific Northwest where they are in season and readily available. So you can imagine, we are THRILLED winter squash is back in season here! If you’ve been enjoying the Paleo lifestyle for a bit, or if you just joined in on the fun, you’ve probably noticed finding compliant sauces can be a little tough at times. Barbecue sauce can be especially challenging because pretty much all store-bought varieties will contain refined sugar. Ugh…so Justin (being the sauce wizard in our house) created the delicious barbecue sauce we use in this recipe. He also created a fabulous post with 5 Easy Homemade Marinade Recipes that will totally rock your world and take your cooking up a notch. Make sure you check it out for simple and flavorful marinade and sauce inspiration! 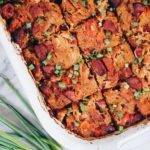 If you’ve been looking for a new casserole to feed your family or just to have leftovers in the fridge, this BBQ chicken casserole will likely become a new favorite! It’s total comfort food, but made with clean, real food ingredients your body will appreciate. 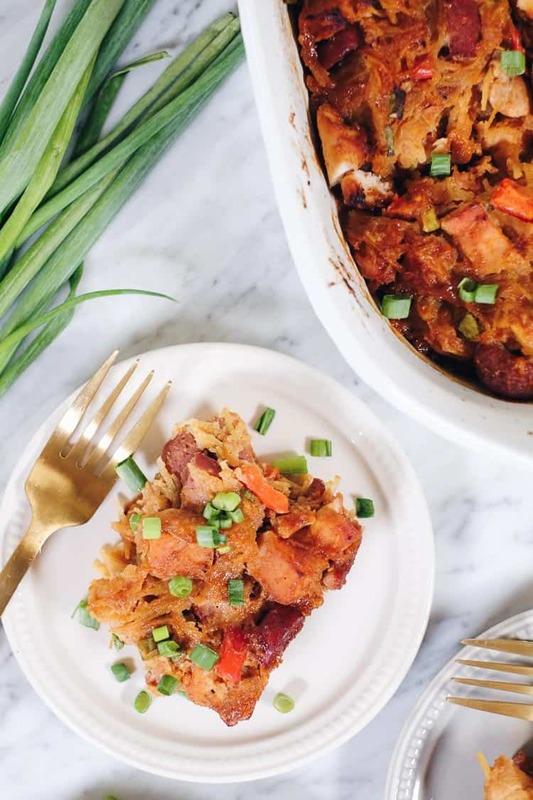 We’ve packed this casserole full of deliciousness, including spaghetti squash, green onions, bell pepper, garlic, chicken, sausage and our homemade BBQ sauce. We typically just roast our spaghetti squash as we’ve explained in more detail in the recipe instructions. The key though is safely slicing the squash in half. Before Justin and I started dating, and I was left to my own devices, I honestly shied away from spaghetti squash because I’m a little accident prone and the few times I tried cutting it myself seemed rather unsafe. BUT….what I learned was that if you just ask someone working in the produce section of the grocery store, they will cut it for you! Total game changer! All I had to do was scoop out the seeds and roast it once I got home. SOOOO much easier! I highly recommend it! Plan this one into your weekend agenda! You can make it to have leftovers on hand or just to feed a crowd! Either way, it will be a new favorite! Let us know how it goes by leaving a comment below. Also, take a photo and tag us on Instagram @realsimplegood, so we can check it out! 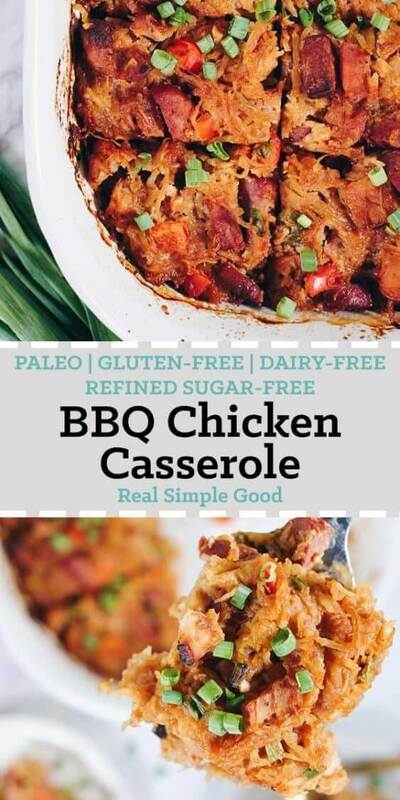 We love when spaghetti squash is in season, so we can make this Paleo BBQ Chicken Casserole. 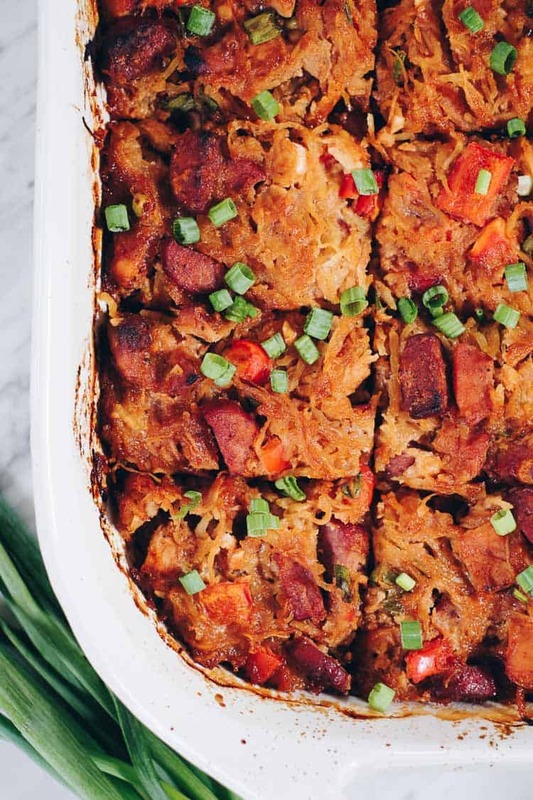 It's a cleaner and healthier way to enjoy total comfort food! Preheat oven to 400° Fahrenheit and grease two medium baking sheets with oil. Cut spaghetti squash in half and scoop out the seeds. Place the squash, cut side down on one of the baking sheets. Place the chicken on the other baking sheet and season on both sides with salt and pepper. Place the squash and the chicken in the oven to cook. Remove the chicken after it has cooked to an internal temperature of 165° Fahrenheit, about 20 minutes. Remove the squash when it is cooked (it will give a little when you press on the skin), about 30-40 minutes. Set aside to cool and keep the oven on at 400° for cooking the casserole. While the squash and chicken are cooking, whisk eggs together in a large bowl. Cut sausages, garlic, green onions and bell pepper as noted and place them in the bowl. Refrigerate. Grease a 9x13 baking sheet with butter or ghee. Prepare BBQ sauce by placing all of the sauce ingredients into a small bowl or jar and mixing well. Once the chicken has cooled a little, chop it into bite-sized pieces and add it to the bowl with the veggies. Once the squash has cooled a little, scoop out flesh of the squash with a fork into the bowl. Finally, add the BBQ sauce to the bowl and mix everything together well. Dump the mixture into the casserole dish and spread it out evenly. Place the casserole in the oven to cook for 30 minutes, until the eggs are cooked and set. Remove from oven and allow to cool for 5-10 minutes before serving. I am so excited that spaghetti squash is back in season!! Love that you added sausage for extra flavor! Can’t wait to try! Made this for dinner tonight. It took us slightly longer than 90 minutes from start to finish, but holy smokes this is delicious! 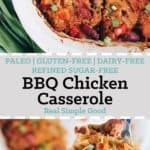 We will definitely be putting this in the rotation, perfect for a Sunday meal prep for leftovers for the week! We did overcook the squash so it was a bit mushy, but I could totally see us sneaking in some quinoa in it next time as well. I read your article regarding difficulty in cutting the squash. You can roast it whole. 30 minutes on one side, flip it and bake for 30 more minutes at 400. When it comes out of the oven, you can easily cut through it and the seeds scoop right out. Tried this recipe as part of our whole eating plan. Delicious! My husband really liked it and we will definitely be making again. I topped with cooked bacon prior to putting casserole in the oven.